Whilst this mani looked great in real life, it didn’t look great in any of the photos I took. Based on the photo, you’re forgiven for thinking it was a nail fail. 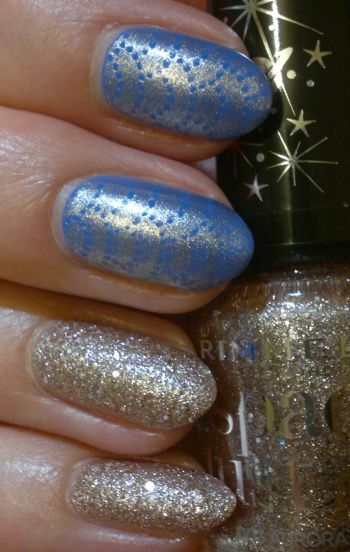 Alright… for this mani I painted my nails with Rimmel Space Dust 003 Aurora (2 coats, pinkies and ring fingers). This is one of the textured (= rough) glitter polishes that were the rage a few years ago. For the thumbs, index and middle fingers I used Sinful Colors Blue La La (2 coats). I decided to stamp. The marine-themed stamping plate I used is MoYou London Sailor 06. The gold stamping polish is Sally Hansen Salon Manicure 819 Coat Of Arms. Oh, and by the way, if you’d like to order from MoYou London, you can get 10% off if you order through this link. Hi there! I have a Nail Of The Day post for you today. For this mani I painted my nails with B. Complete 154 Brit (2 coats). This is supposed to be a long-lasting quality polish, but it’s not. Sensationally dull finish. Tip-wear in record time. I paid 10p (!) for this polish, and this is exactly what it’s worth! 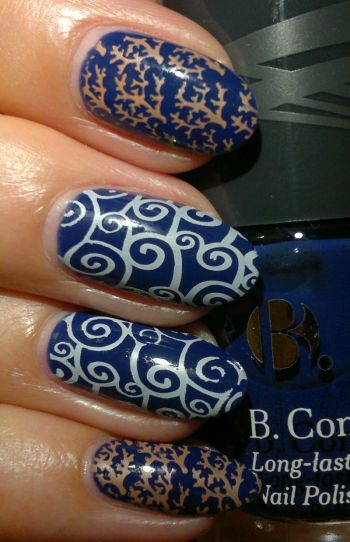 MoYou London Sailor 06 plate and MoYou London Powder Blue stamping polish (ring and middle fingers). 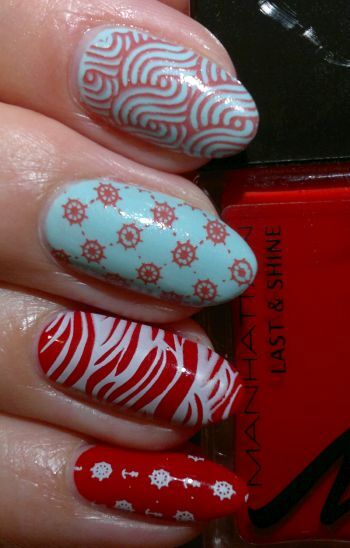 And Pueen 91 plate (from Pueen‘s Buffet Leisure stamping plate collection) and MoYou Cancun Coral stamping polish (pinkies, index fingers, thumbs). For this mani I painted my nails with Manhattan Last & Shine 620 Red-Y For Me? (2 coats, pinkies, ring fingers) and Revlon 044 Blue Lagoon (2 coats, middle and index fingers, thumbs). I used 2 stamping plates – MoYou London Sailor 06 (large images) and MoYou London Sailor 13 (small images). The polishes I stamped with are MoYou London Powder Blue (pinkies and ring fingers) and Revlon 902 Craving Coral (middle and index fingers, thumbs). I really liked this mani. It was fun to look at for a few days!